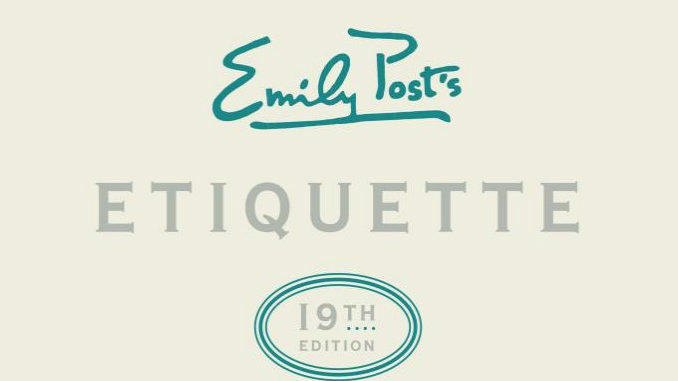 Etiquette by Emily Post, originally published in 1922 and now in its 19th edition, is one of the most popular reference books ever published in America. I was raised on my mother’s copy of the 3rd Edition. It sits in my office today – one of three editions I own. Etiquette and the teaching of good manners have flourished under the stewardship of five generations of the Post family, now organized through the Emily Post Institute in Vermont. Indeed, the Post family enterprise is an excellent example of building family wealth by making a quiet but enormous contribution to the civic life, health, and prosperity of America. Emily Post’s great-great-grandson, Daniel Post Senning, joins me this week on the Solari Report to discuss good manners – how we learn them, pass them on to our children, and evolve them in both a changing world and a digital age. Daniel is a co-author of Emily Post’s Etiquette, 19th edition and The Etiquette Advantage in Business, 3rd edition. He is also the author of Manners in a Digital World: Living Well Online, and co-host, with his cousin Lizze Post, of a weekly podcast, Awesome Etiquette. When I am appalled by some bad behavior online, I sometimes head over to the Institute’s website for some inspiration and age-old wisdom on how to integrate divine intelligence into our daily lives. From big issues of ethics and honesty to the protocols of table manners and social rituals, the Emily Post Institute is a treasure of “how to” resources for nurturing a more human civilization. In Money & Markets this week I will discuss the latest in financial and geopolitical news from Friesland in the Netherlands. I am collecting stories at the Money & Markets commentary. It’s a great place to post questions and suggested stories and links – or e-mail them for Ask Catherine. In Let’s Go to the Movies, I will review The Power of Your Intentions by Truthstream Media. Aaron and Melissa Dykes describe the famous “rice experiment,” which underscores the value and importance of thoughtfulness and good manners.